A deck is your outdoor oasis where you can escape the indoor world while being elevated and separated from the rest of the world outside. A new wooden deck is a solid structure that is under constant attack from the elements. Pressure-treated wood that is properly maintained can repel this assault for many years. 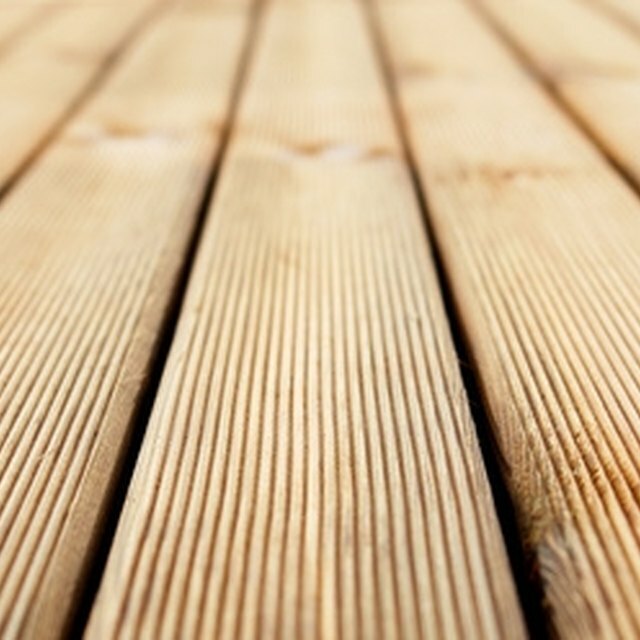 Cleaning, sanding and sealing your wooden deck is the best defense against the elements. Deck sealing chemicals vary greatly from brand to brand. Choose an epoxy sealer that is specifically designed to repel ultraviolet rays for best results. Sanding and sealing your deck yearly will keep it splinter-free and ready to use. Sweep the deck thoroughly with a stiff-bristled broom. Sweep away all debris and loose material, removing everything from the deck. Spray the deck and rails with a water hose. Wet the entire structure, including the underside of the deck. Mix mild liquid soap and water in a 5-gallon plastic bucket. Pour the soapy water onto the deck. Scrub your deck from top to bottom with a scrub brush. Keep the deck wet with soapy water while you scrub. Let the deck dry completely before continuing. Smooth the deck with a belt sander. Sand the deck from top to bottom including the rails and underside. Sweep away the dust from your sanding operation. Wash away any residue with a water hose. Let the deck dry completely. Apply a smooth, thick coat of UV-stable, epoxy sealer with a natural bristle, 3-inch brush. Let the sealer dry completely before using the deck. Work gloves and safety glasses are required when using hand and power tools. A dust mask is required in addition to your gloves and glasses when sanding. Rubber gloves, safety glasses and a dust mask are required when applying chemical sealants.